Easter may be typically associated with bunnies and chicks, but that doesn’t mean cats can’t be included too! 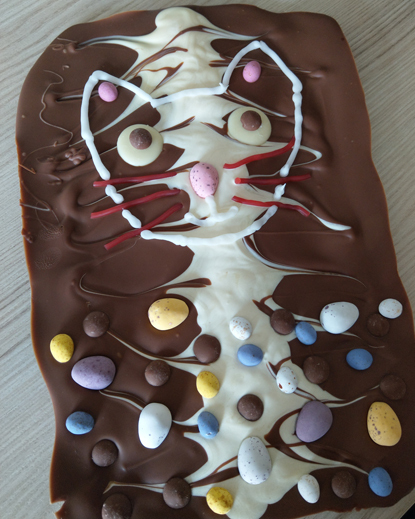 If you’re wondering what to get the cat-lover in your life for Easter this year, have a go at creating some of our egg-citing chocolate crafts decorated with fabulous felines. Line a baking tray with greaseproof paper, then melt the milk chocolate in a heatproof bowl over a saucepan of simmering water. Do the same with white chocolate separately. 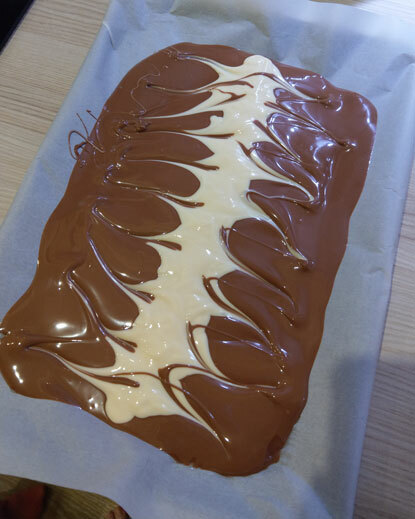 Pour the melted milk chocolate onto the greaseproof paper then immediately pour the melted white chocolate in a line down centre. Use a skewer to create swirls, lines or other decorations with the white chocolate. Leave the chocolate to cool for a few minutes, then while it is still slightly melted add a mini egg nose, micro egg inner ears, white chocolate button eyes and strawberry lace whiskers. Decorate the bottom half with assorted mini eggs, chocolate chips and your (or the recipient’s) favourite sweets. Place your chocolate slab in the fridge to set for around 30 minutes or overnight. You can then pipe on the cat’s outline and mouth in icing and use dots of icing to stick some milk chocolate chip pupils on the eyes. Once the icing has hardened you can carefully remove your slab from the tray, peel off the greaseproof paper and place it in a gift box to give to your cat-loving friend or family member. 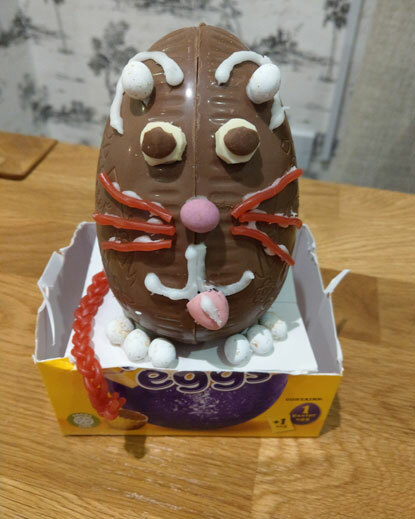 On the front of your chocolate Easter egg, use dots of writing icing to stick on a mini egg nose and inner ears, white chocolate button eyes and strawberry lace whiskers. Use more icing to pipe the outer ears and mouth and stick milk chocolate chip pupils on the eyes. Cut a mini egg in half and use some icing to attach it as a tongue. Stick some more mini eggs to the base of your Easter egg as toes and twist some strawberry laces together to create a tail. 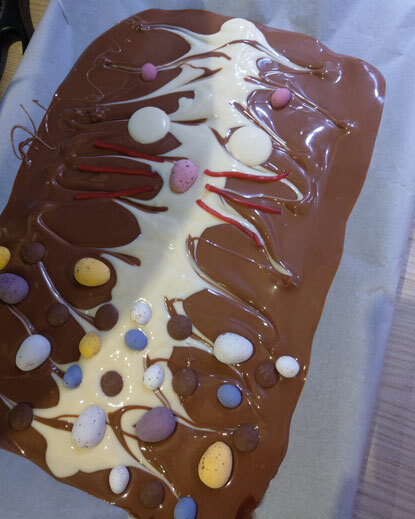 To make your chocolate slab and Easter egg suitable for vegetarians, leave off the strawberry lace whiskers and pipe them on with icing instead. If you have a go at some cat-themed crafts this Easter we would love to see them! Share your egg-cellent photos with us on Facebook, Twitter and Instagram.